Ground Control to Major Deadpool! After bumping off Macho Gomez, the galaxy's top assassin, Deadpool heads into space to increase his intergalactic cred. Abandoning his plans to become one of Earth's heroes, he decides to stop pulling punches, knives, swords, bullets, grenades and so forth. Everyone's favorite fun-loving killer-for-hire is back with a new job and a new lady! Will this cement him as the solar system's best, most ruthless mercenary - or will things like lack of oxygen and zero-gravity throw him off his game? One word: maybe! Wade's first contract is a doozy, as he's hired to kill Id the Selfish Moon. This body is anything but heavenly and travels through space destroying planets. 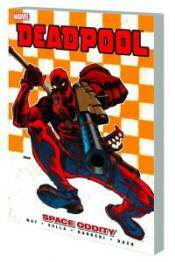 For this super-sized job, Deadpool follows his usual credo: The bigger the problem, the more insane the solution! Collecting DEADPOOL (2008) #33.1 and #32-35.